Angel Bay Crafting Hearts: June Special...STAMPAGANZA!!! I am so stinkin' excited to share this with you that I can hardly stand it!! 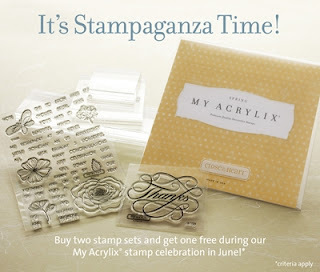 The June Special is Stampaganza...buy two stamp sets and get one free! This is such an AMAZING special! You can get some of those stamp sets that you've had your eye on and just been waiting to purchase. Now is the time!!! Our FABULOUS stamps are already at an affordable price point, but when you get one free, that's truly the icing on the cake, as they say! It's so simple, but let me give you the specifics. For every two stamp sets (A, B, C, D, or E) that you purchase at regular price, you will receive one of equal or lesser value FREE! This is a savings of up to $29.95! I know a lot of you that have been looking at the E-Sized Alphabets (pages 29, 36, 48, and 113-118) for your page titles and monogram cards, etc. I also know that a lot of you have been wishing to get some sentiments sets for your card making. There is no better time than June to buy your stamps! 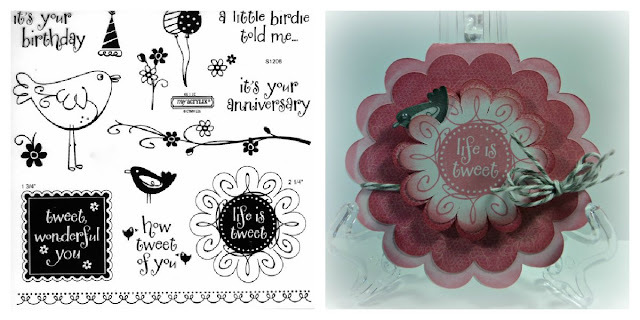 Also, when your order totals $50 or more, you can also buy this CUTE stamp of the month, Life is Tweet, for just $5.00! Check out this ADORABLE card that my dear friend Brenda Rose made and sent to me!